I have been thinking about the human-horse relationship more and more lately. I used to think training was about getting the horse to do what you want/need, hopefully in a gentle way but the point was… Well… Obedience. It would be a bonus if that would also equal willingness. Kind of like a big dog. tacked up ready to go- i removed the flaps from the saddle and love it even more now! 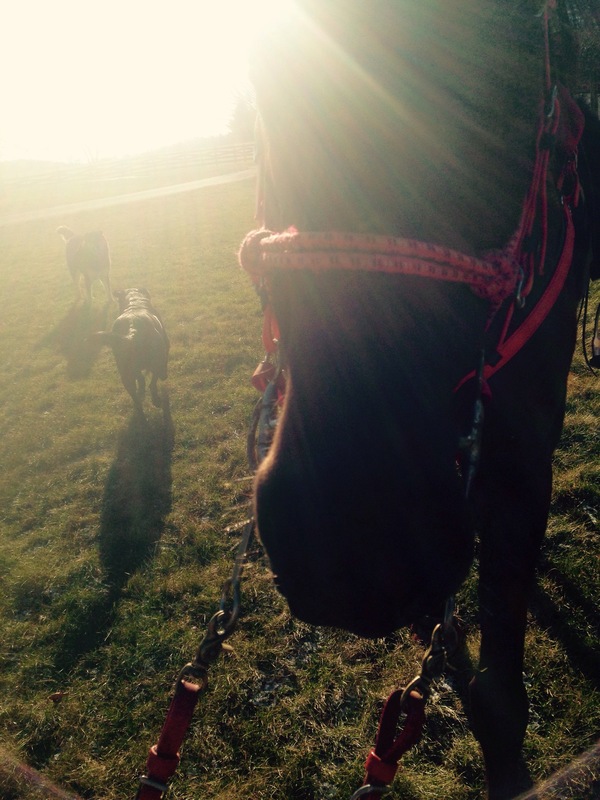 Stand still to mount… Side pass… Move out of my space… Stand still for the farrier… Walk when I say walk and trot when I ask for trot… Always stop when I ask (on a dime would be best)… Oh- and load on the trailer upon command too if you don’t mind. …I used to think ‘control’ of your horse obviously. But now I am starting to thinkthat it is more ‘control’ of your relationship. Lead partner in the dance. I hear people talk about the partnership all the time- but I don’t think I really understood (understand?) what that means. The more you know… The more you see you don’t know. 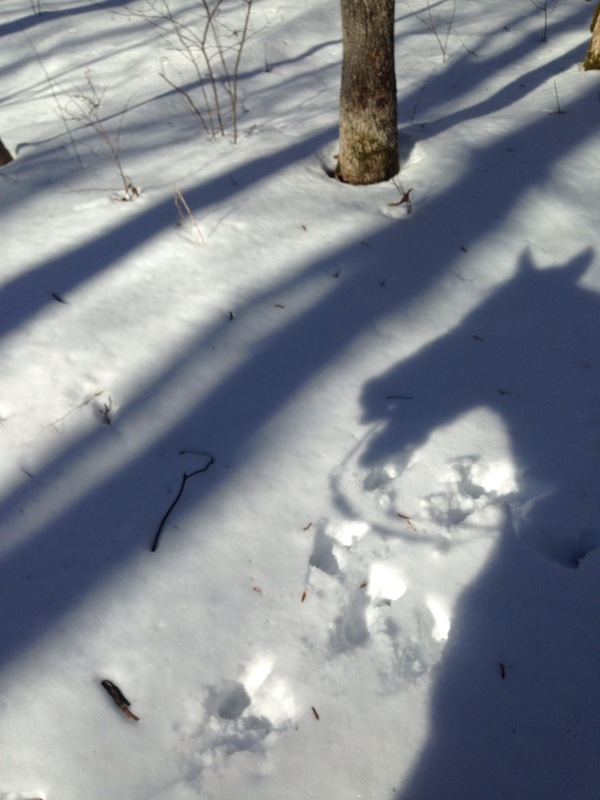 So I’ll say first that riding lately has been wonderful in the snowy mountains and the horses are both doing well with more mindful time with them. 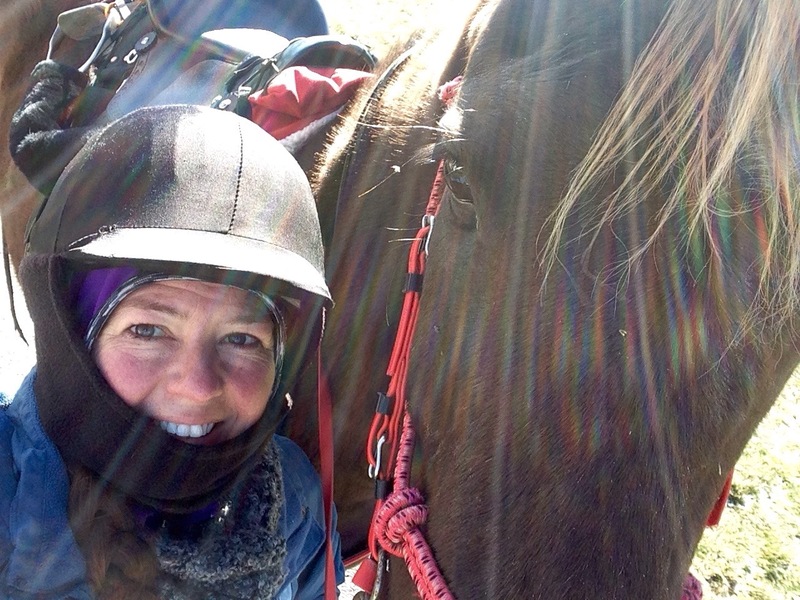 Susan and I had a brilliant 15 mile ride over the weekend where we tacked up loose lead and really made an effort to be present in the horses’ world. We tossed out the watch and did everything with as much time as it took to not rush the process. The ride Saturday was a big climb and since we still had enough snow to be a factor slowing us down I thought it would be a great ride to condition slow hills, muscles etc. Early in the ride both horses stopped at a water crossing and didn’t drink. Just stood there. Susan is even more goal oriented than I am- she asked if we should ‘move along?’ I said hold on- it was interesting to me that both horses were not moving or drinking on their own. Khaleesi was yawning and licking and chewing (a lot) and Faygo looked like she was in a trance- breathing a little hard but not bad- we had started to climb a little. I was looking for the change. Thank god the friends riding with me have patience. Then it happened- Faygo ‘woke up’ and on her own started to move forward. I don’t know what that was about, but we had all the time in the world and it was interesting to me to see that play out. We passed other water crossings and they didn’t stop at one of them in that way the rest of the ride. After about 10 miles Susan and I talked about what an amazing ride it had been. Both horses were willing and forward and neither of us had arguments. It was the best ride yet since we started riding together (and none of them had been bad). 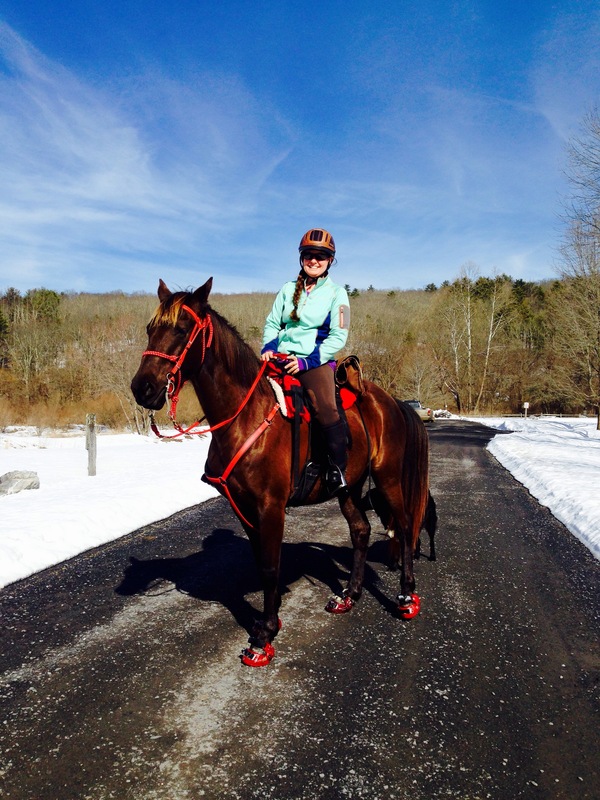 The next day I’d had plans to meet a local endurance rider who I knew would challenge khaleesi to move out. 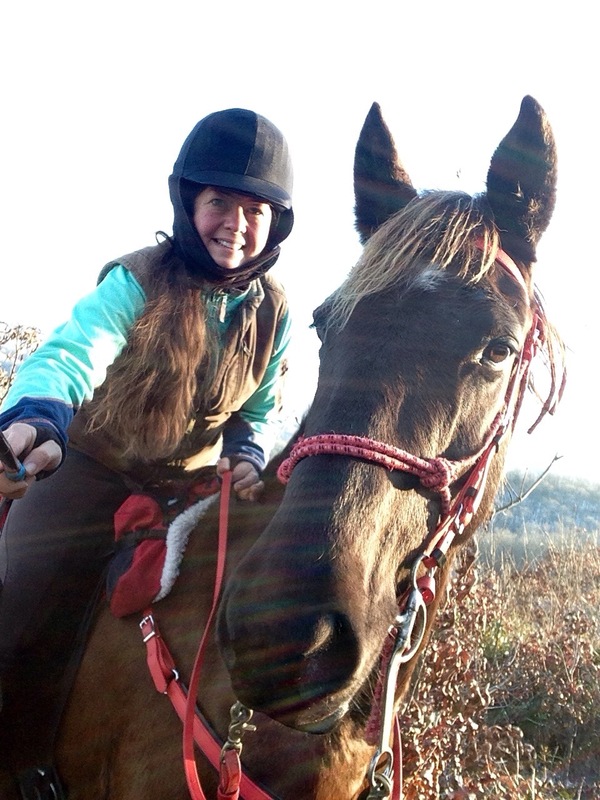 She had a lot of experience and a racing ‘pony’ but I’d heard she would also be happy to have someone to ride with and not ‘leave us in the dust’. I wasn’t sure how it would go but I was looking forward to meeting her. 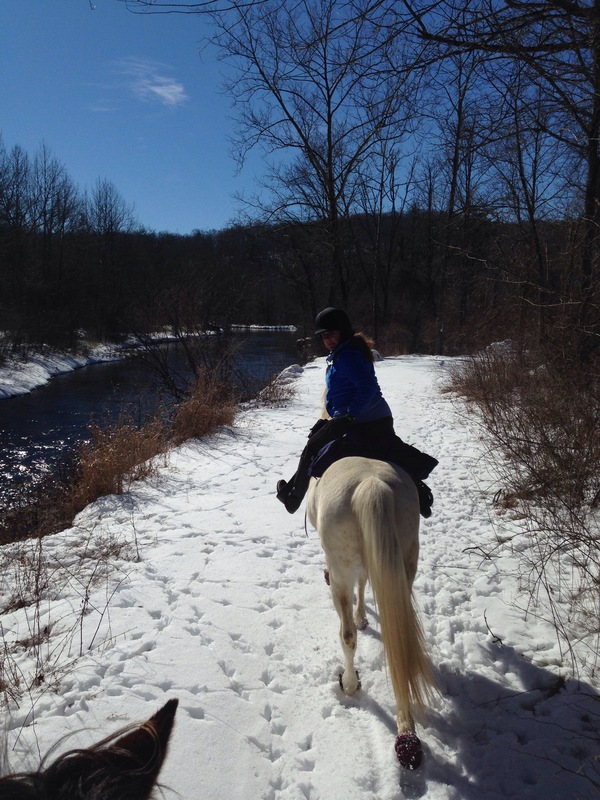 The snow cancelled our plan (for her) and though I was disappointed- I know you always get the ride you need – that was not our ride today for a reason- and I decided to trailer Khaleesi to hidden valley for a lovely fun fast ride together. Just the two of us. I feel like I’m struggling to pick up her speed. I read about all these other riders and their horses who ‘eat up the trail’ and that 5mph average speed is what they consider LSD (long slow distance). If I push Khaleesi we can average 5mph but what I love about her is that she’s solid, not spooky or fearful, and not really ‘hot’… However this also shows up in her laid back work ethic (or so I’ve thought). I know she’s young so I try to keep my doubts to myself but wonder sometimes: is she cut out for this? 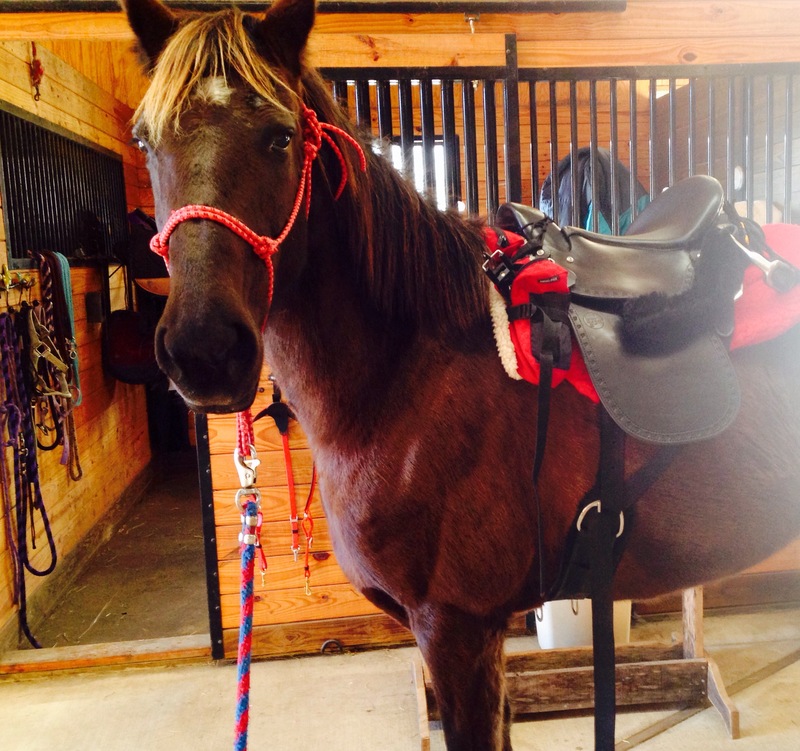 Or would she rather live a dressage horse’s life? She always seemed to love our time at pam’s in the arena learning things together. So Sunday I intended to make it a shorter ride and see if we could pick up some speed. More trotting than walking. Get her cardio up- maybe even build a sweat. She hasn’t been challenged much in our rides these recent months. 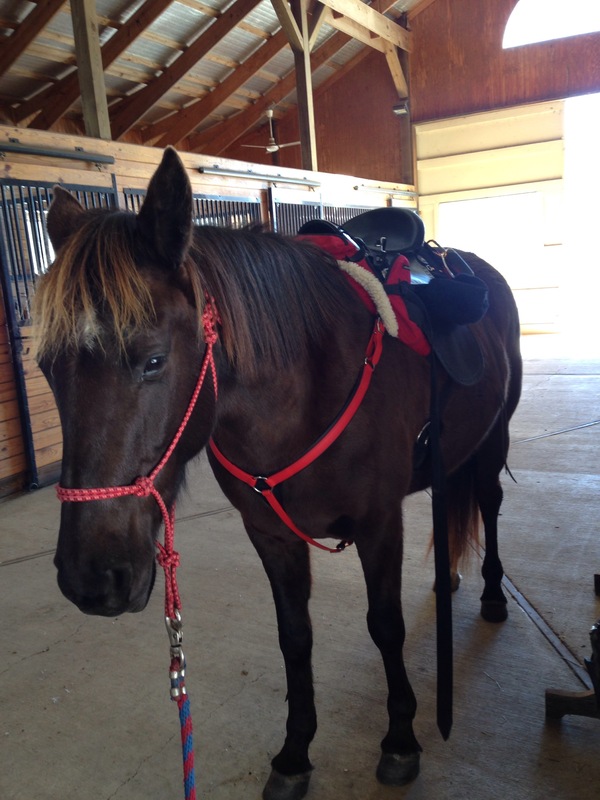 Faygo is a great training partner but her physical limitations make the rides a work out for her and yet Khaleesi doesn’t breathe hard or break a sweat. It started really well and she seemed to happily trot out the trail from the parking lot that borders the river and a snow covered field. This is exactly what I’d hoped for. And she was moving well without me having to ask. And we kept on this way walking and trotting until a section of trail about 3 miles in when she kept looking up to the left. I assume that her turning around is because she is lazy and doesn’t want to go for a ride. She wants to go back to the barn or trailer. 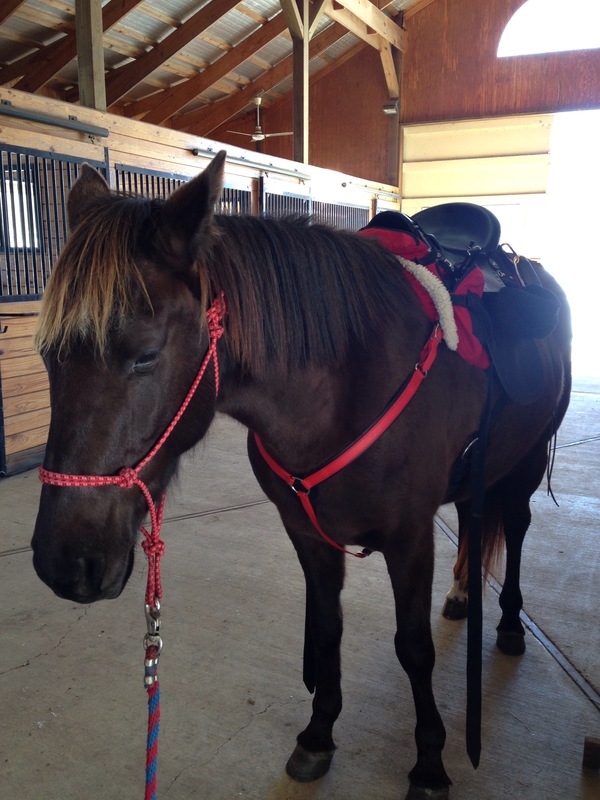 How can a lazy horse do endurance?! So back to training & obedience right? No- we aren’t turning around. This is our ride today. We’ve been here before (but not very often). So I decided to wait. I let her stop on the trail but I did not let her turn around. She would yawn…lick and chew… Stand still… Sometimes try to turn around (I would ask her not to turn facing the other way though we spent most of that time crosswise on the trail). The dogs got confused- came back and sat down next to us inquisitively. Sometimes she would put her head around and rub my shoe with her nose. How long can she wait here? 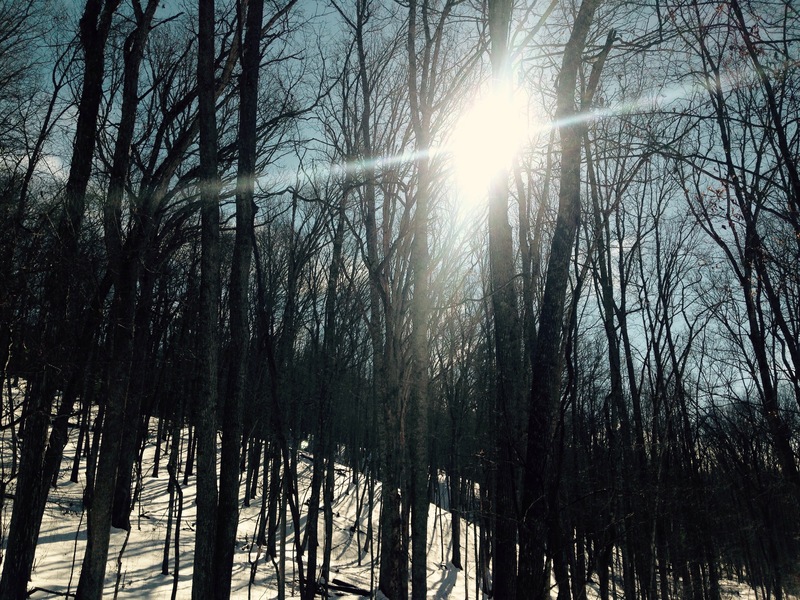 I slowed myself down and looked at the sun coming through the trees and I listened to the stillness of winter. I reflected a moment on how I’m always on the move and don’t take time to be still enough. I heard her breathing the deep breaths when she’s laying down in the sun I’ve heard before. Slow and deep. And after 10 minutes she did not move from that spot and I thought it would be fascinating to see if we would stay here for hours or all night but I just can’t go that far. I wanted to wait her out but my watch won this time and in part against my better judgement I asked her to please keep moving. She did- we were so low energy by now it was just a relaxed walk, and she asked to turn around 3 more times and I said no. Eventually we regained energy and trotted off and kept a nice pace again. She did not seem agitated or unhappy. She seemed to want to avoid the gate. (We’ve been through plenty of times) and as I asked her to go ahead (and she did without fuss after that)- we headed back to the trailer. Good right? 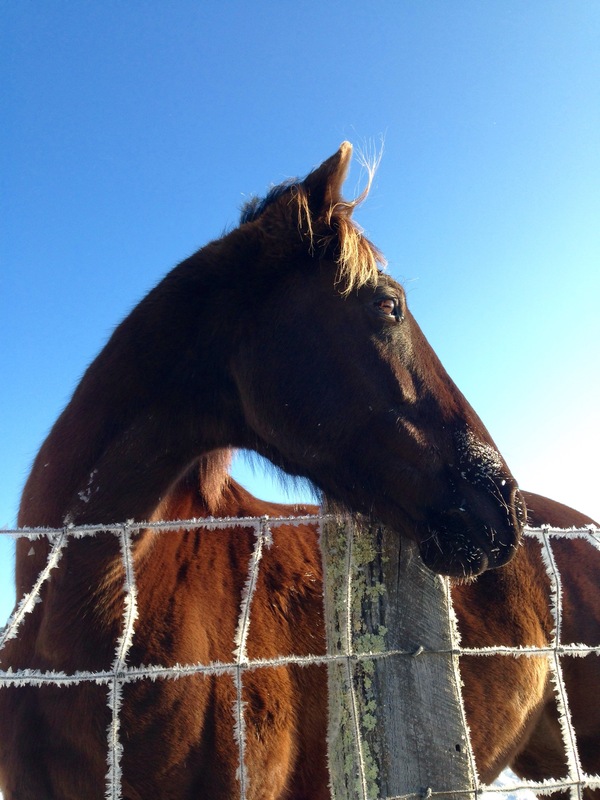 My horses always love to get back to the trailer and eat some hay and go home. 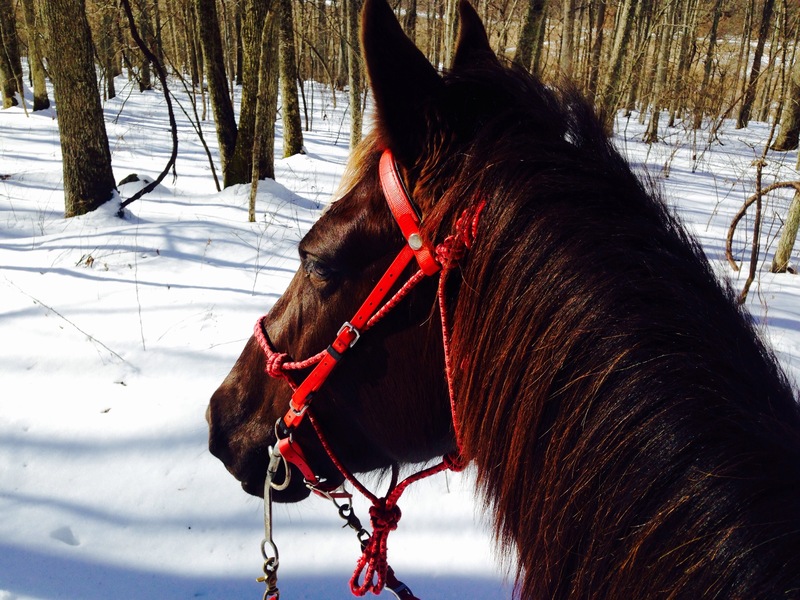 She stopped – seemed to almost shy and slowed her pace as we approached (ok- good to walk in…) and as I let the reins go to grab my GPS I realized she took a wide berth around the trailer in a huge circle. I didn’t ‘correct her’ and move her to the trailer (I’m sure I would have before) but she was walking nicely so I just let the reins lay and wondered what she would do. 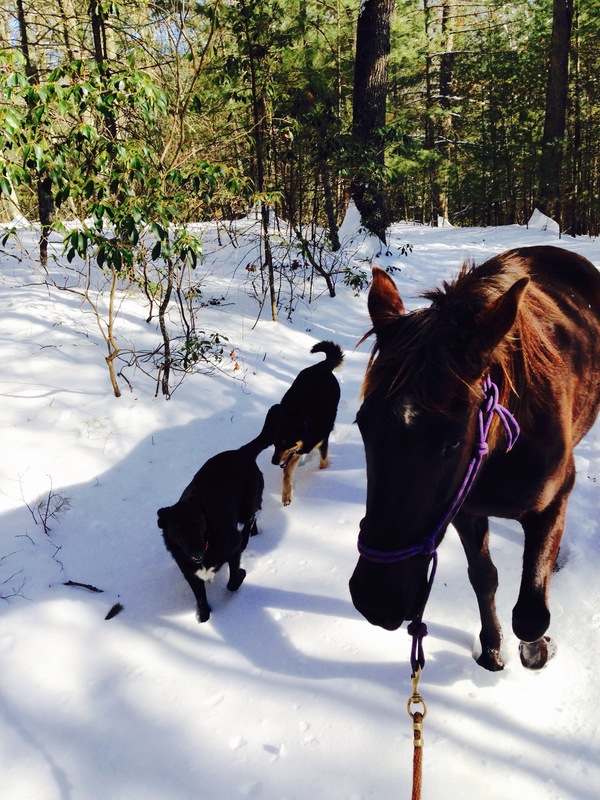 She walked right past and toward the trailhead- but turned instead toward the B&B. She walked right across a low cement bridge that she will cross but doesn’t usually like to because of the rushing water sound. Then she walked off the path and over to the fence and started eating some grass. So we hung out there a while and ate grass (I ate my granola bar). Eventually I asked her if we could go back to the trailer now? 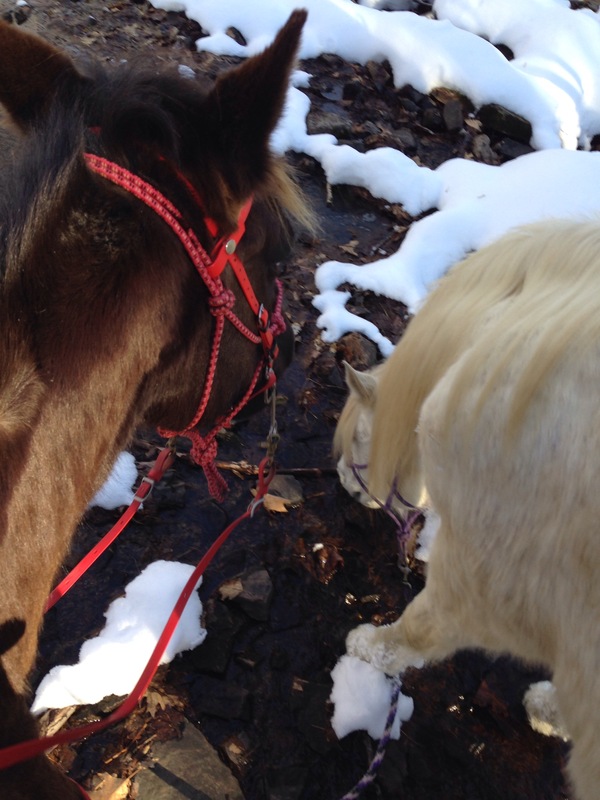 But again I let the reins down and she turned instead back to the trailhead NOT the trailer. Ok? Now what? I’m game- what do you want to do now? What are you trying to tell me? 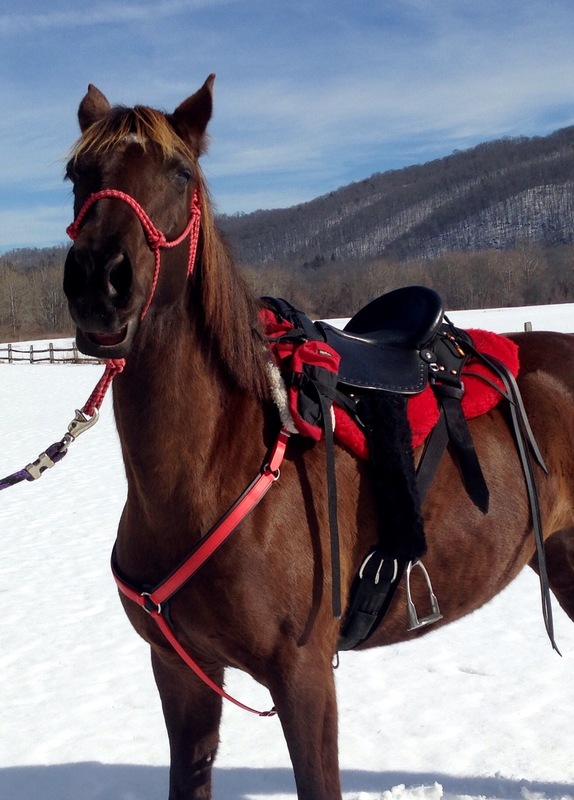 So she cut through the snow field and completely on her own picked up a lovely slow trot. 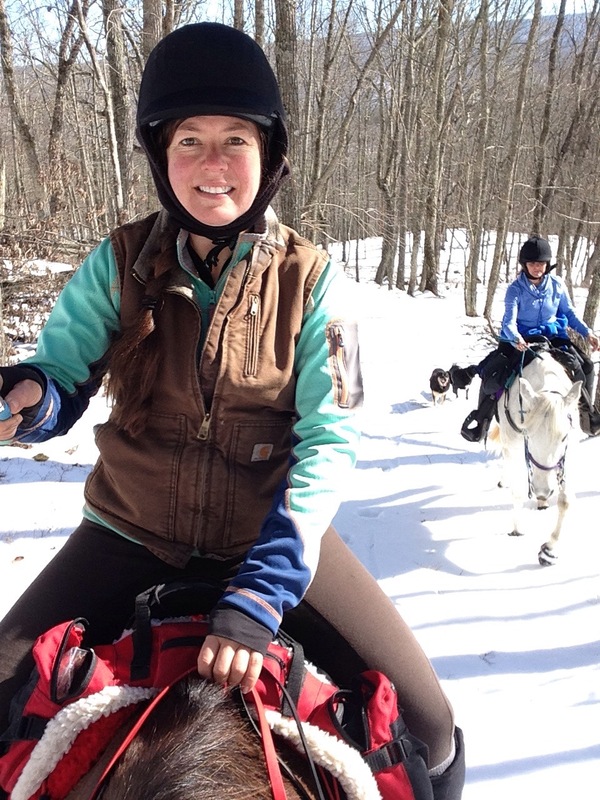 We trotted without stopping over a mile back where over we had gone first that day. She stopped to walk at one point looking for the dogs (we’d left the behind but not terribly) after they had caught up she picked up again and kept trotting only she chose a different route (we did not get to the spot she stopped on the trail earlier) and headed on the direction that could (on a long ride day) take us all the way home. The river crossing for that was high with ice on the edges. We’re not doing this today. 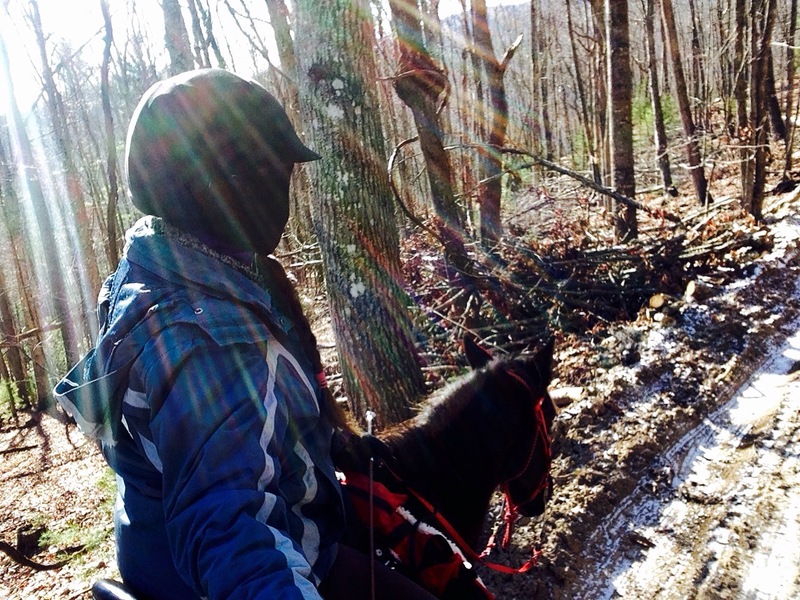 She did stop on her own and seemed unsure about the icy edges. I’m not truly sure I understand you- but I appreciate you giving me a chance. 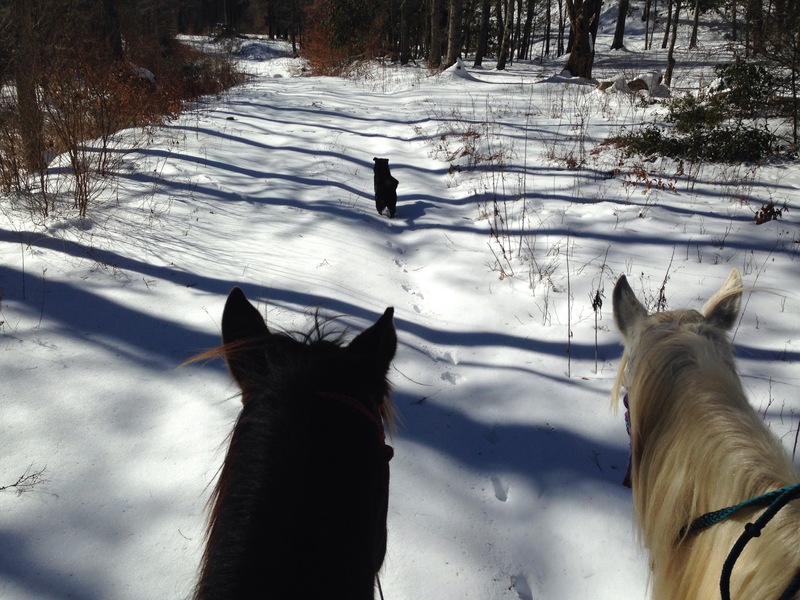 We can’t go that way today- and we do have to get home before dark so we need to go back to the trailer. Can you work with me on this? We turned around and every little path that went down toward the river she would try to take- we took one and she seemed satisfied that this was not the best way (dead end). I did get her back to the trailer but she was not as forward. She wanted to turn around a couple times but I told her no. We can’t. When we got back to the trailhead she had added 4 miles to the 6 we’d done the first loop. Our average speed was 4.8 mph including the slow walking we’d done after her 10 minute stop. I got off and walked with her the last yards and rubbed her and told her how great a ride that was and what a fantastic horse she is. 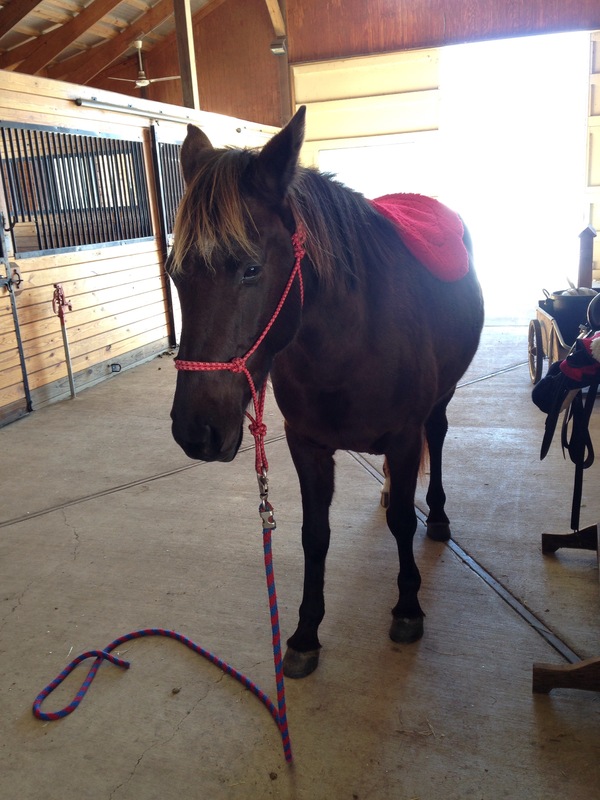 She ate hay and did not seem stressed at the trailer as we untacked. She sidestepped the trailer the first try and then walked on pretty nicely the second. On the drive home I felt different. I felt as if we’d communicated something between us for the first time ever. I was part of a moment when she trusted me enough and I trusted her enough to be honest and I said “ok, I’m listening”. It was like being invited into a secret world for a brief visit and we were different for that time. I loved when she was forward and trotting out and seemed to know just what she was doing but not ‘out of control’ either. I felt like she was talking to me for the first time (though I know they communicate all the time- this was different somehow). 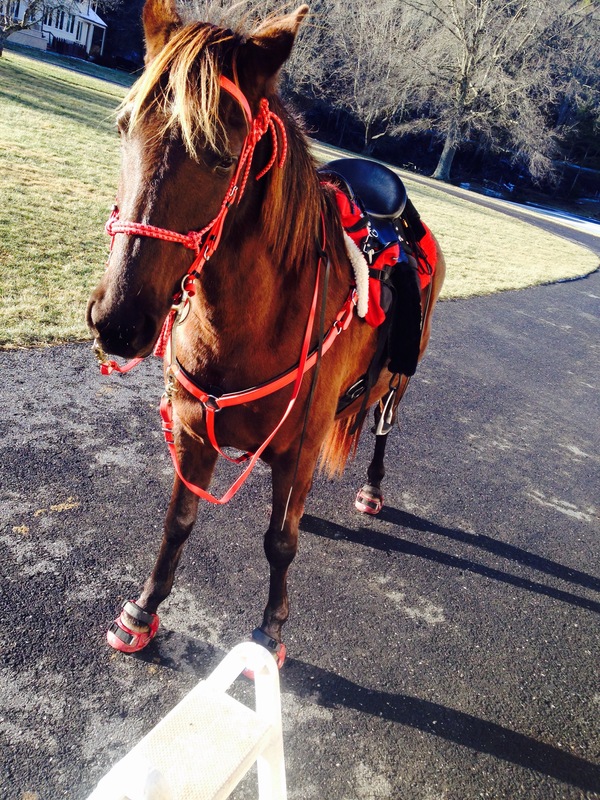 Have I underestimated the complexity of thought, personality and preferences my horse has going on? Do I assume too much that I understand her? She wants food… She is lazy and doesn’t want to work… She wants to go back to the trailer… Today one thing I found was that she is not slow or lazy. She moved beautifully and when we got to the trailer – even if she wanted to go home she seemed ready to trot another 10 miles on top of the 10 we’d just done to get there on her own 4 feet. That isn’t lazy. What was she saying? Was it a concise message I didn’t get or was it just fun to be able to make her own choices for a brief time and a fun random jaunt? Is there something about the trailer? She’s not particularly afraid of loading, but is there something annoyong? more noise lately? Maybe I should have the tire pressure checked… Did we hit some curves too fast or bad bumps from the winter weather that makes her not like it? How do I listen to her and get to know her and still stay the leader in the dance? She may have wanted to jog home on her own 4 feet but that wasn’t possible that day. 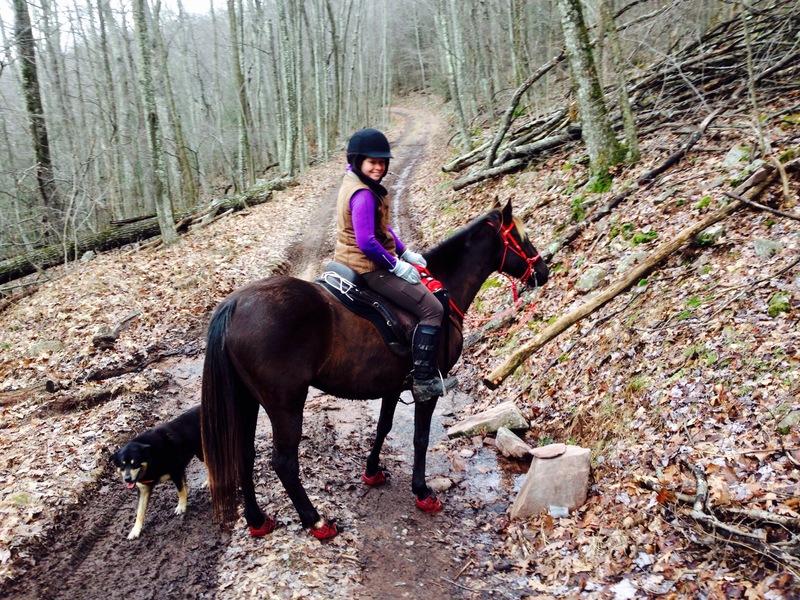 Sometimes she may not want to go out in trail- but we all have to do some things we don’t want and obviously turning us around on trail is not a discussion I want to have every ride. When are we having an appropriate conversation and when is she now in control? 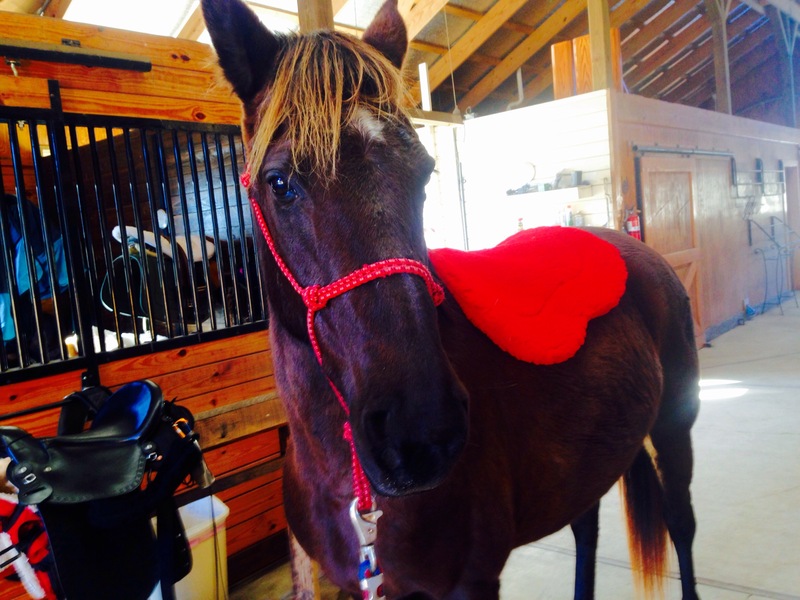 I don’t want (nor is it safe) to have a horse who doesn’t pay attention to me or respect me. At the same time I don’t want an obedient robot. This reminds me of a fellow blogger who posted about a rescue dog that came to them with perfect command obedience. She said it was uncomfortable (robotic?) and thankfully in life with them the dog relaxed a bit and was well mannered but seemed to be able to express himself and have a personality as well. 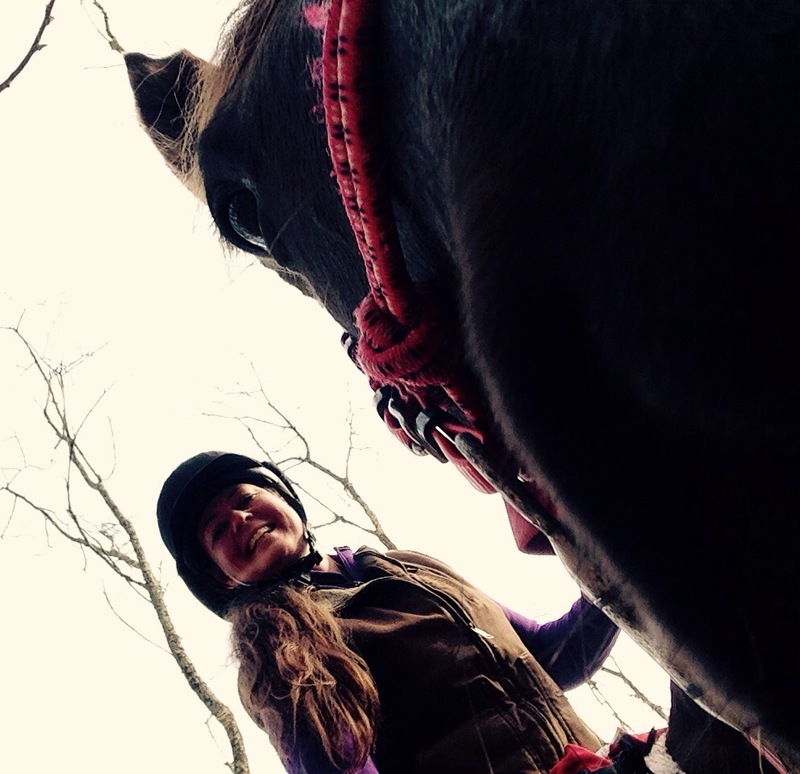 I ride a horse and not a dirt bike because I want the personality and relationship. I don’t want to ride a robot horse but I need to lead the dance. 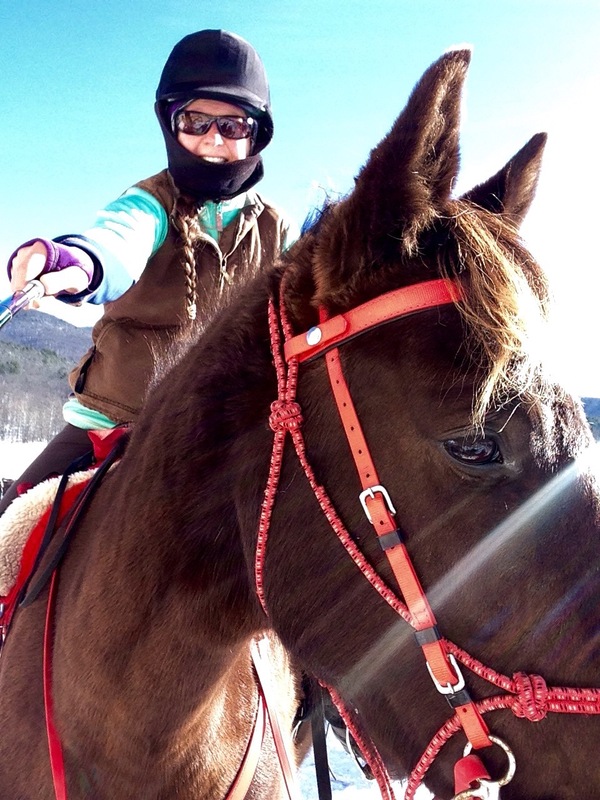 Last winter I spent a lot of time riding Faygo and ponying Khaleesi along to help build her fitness. I used to nickname her ‘the anchor’ (not a great nickname for an endurance horse in training I suppose). 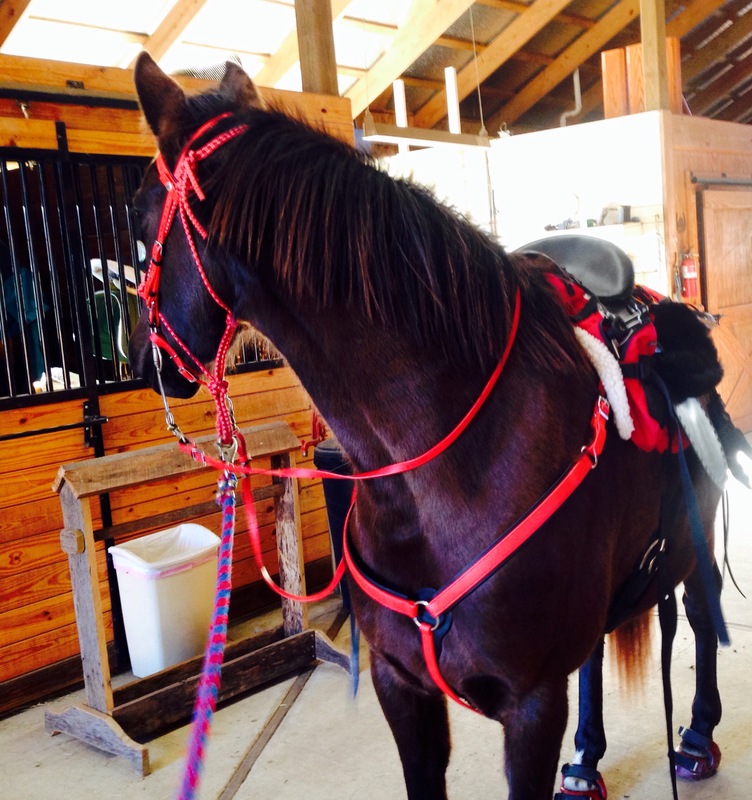 Today was the first time I rode Khaleesi and ponyied Faygo. We just finished with a 2-day snow storm that hit the entire north and central mid-east with a beautiful layer of snow. 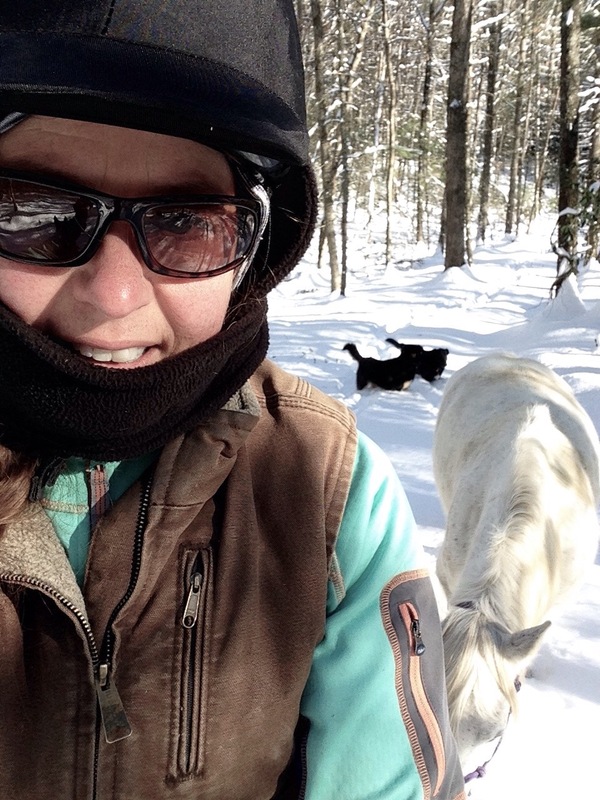 We ended up with barely over a foot which is perfect for a good snow ride- and when the sun came out on day 3 with temps around 30 I gladly got out of the house and headed to the barn. I decided to bring in both horses for a mash (beet pulp and grain) and some attention. I let Faygo relax with some hay and worked on new ideas I’d picked up while re-watching another of Buck’s videos during the snow-in. It seemed ridiculously simple. Ask for a back up of a few steps- then change to a move over by pushing at the air by her head-neck. I know we can back up, and if I walk into her head space while leading she moves away and makes room for me to circle while she pivots around. This seemed *almost* the same. Might as well try it. We had the back up just fine- but she just stood there as I pushed my palms into her head “airspace” as if I was an alien she did not understand. I am always amazed at how something so similar to a thing we DO know can be completely foreign. So I did the next suggested step and pushed gently into her by her jaw. She actually moved toward me- barely- not aggressively but either slightly frustrated or confused. Eventually as I persisted she got it and stepped over. Then we relaxed and tried again. She picked it up pretty quickly after that but it was interesting how she had to learn that separately from move out of my space when leading. We then worked with clicking to move toward me. We ONLY click (or cluck or kiss) to ask her to move toward me. Again- she knows this when I stand away from her and click to her to walk forward toward me. I click to her when I ask her to come stand at the stool for me. She does that pretty well. I’ve also started tapping her shoulder to move it toward me with clicking sounds. She does ok- we get at least one step toward me right now and then move on to something else. Today (feeling ambitious) I thought I’d try the hind. So I would tap her hip gently with two finger and click. She tried everything except move toward me. When she at least was moving her hind I released and thought it over…. 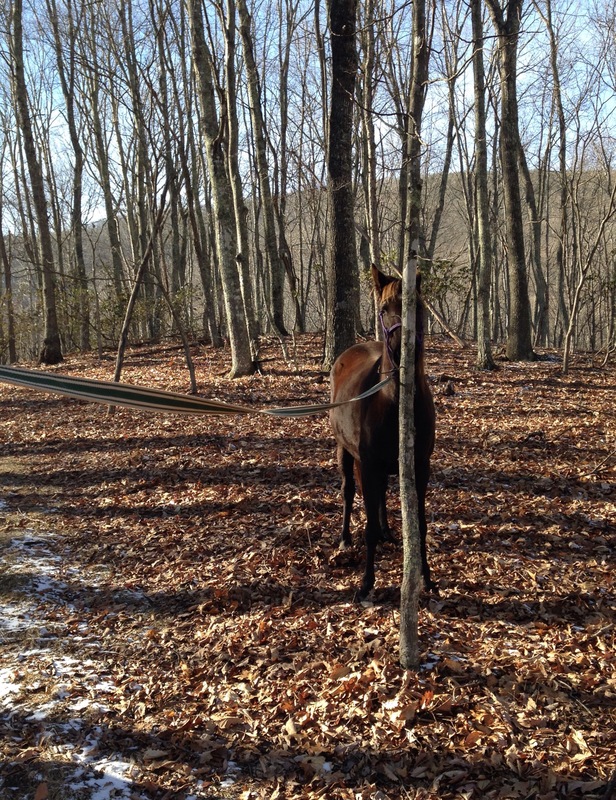 The next time I moved the lead rope under her neck to her far side and loosely left it around her hind with no pressure. Started tapping and clicking again. She wasn’t sure what to do and when she started to move her front I gently put pressure on the rope which had the effect of asking her head to move away and led her to step her back foot just an inch toward me- I let go of the rope and rubbed her neck. Great job- you are so smart! I let her think a few minutes (she was in think mode) and when she was done we did some review of easy things for a couple minutes. Then I tried another angle. I had her near the barn wall- so moving away from me was a hard choice- and asked her to shift her weight on the rear leg to the foot away from me. Then I clicked and tapped at her hip and she shifted and stepped an inch toward me again- knowing her weight was on the foot away from me made the shift toward me more likely. We stopped there for the time and did a few simple review things again; then I put her in place for tacking up- loose lead. 2:09pm: saddle set in place. I had to play around with the pad as I wasn’t happy with the placement and that did not help. She fidgeted a decent amount but we got through it. 2:13pm: girth at first hole on each side. She was much improved here. 2:16pm: breast collar is on and more holes tightened. She was visibly relaxed as we went through this. 2:18pm: up to 3rd hole on each side. 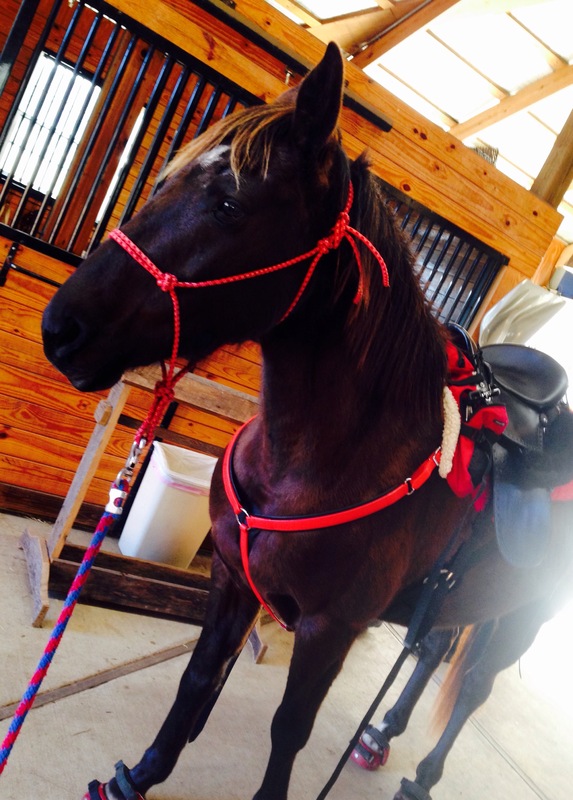 Ready to give her a break while I grab her head stall and get ready to roll. 2:38pm: we are mounted and ready. bit still poses no issue. Stood more quickly at the stool and still for mounting. I can’t say if I took the same amount of time in the break. That is when I make sure I have water, set my GPS, last bathroom break, grab my riding gloves and other last misc. things. Last try (Thursday) we were at just under 60 minutes. Today was 35 minutes. And the process was noticibly easier. This is worth keeping up with! Because I couldn’t bear to leave Faygo behind we decided to take her along. It was a nice 5 miles walking in the snow. 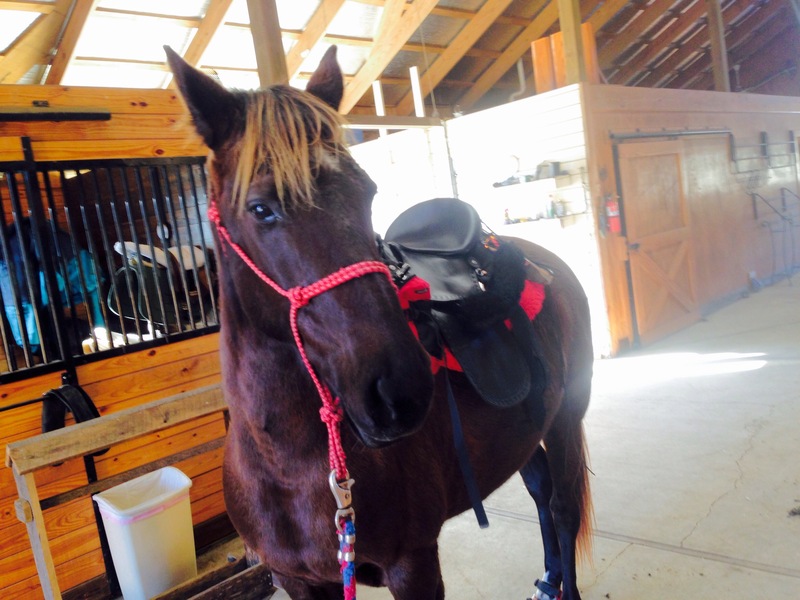 Faygo is easier to pony than Khaleesi was a year ago. 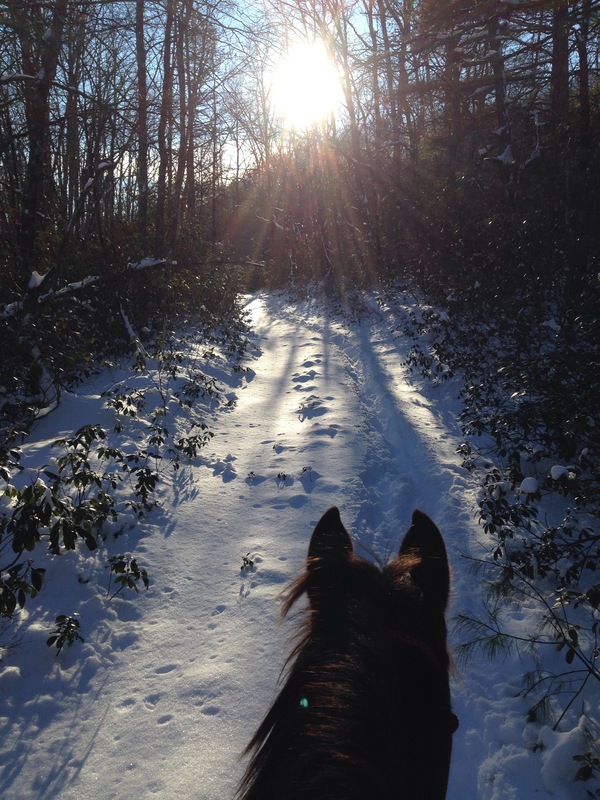 It was everything I love about a good winter ride: beautiful, quiet, peaceful and still. 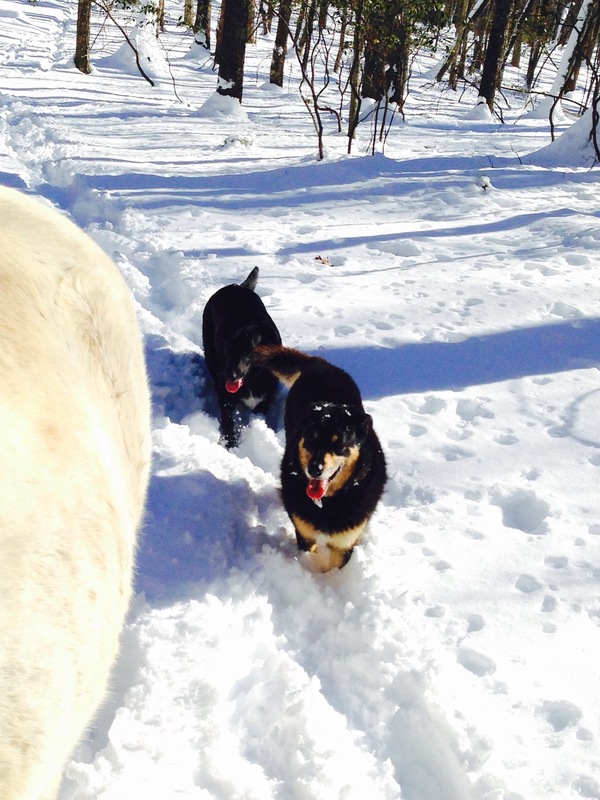 The dogs hopped along happily through the snow as well. I think it fits her great. And today I really started to feel settled into the seat. It’s comfortable, secure and I do love it! I am sure we will find our sweet spot as we get more time in it together. It was fun to remember a year ago when our roles were reversed. Khaleesi did really well today as the lead horse and though she can still throw a tantrum and threaten to kick horses that invade her space (though I never allow it I know it’s still possible from time to time) she was tolerant of Faygo and they were fun to have out together. Faygo’s only issue was in thinking she should be able to take the lead heading home. I suppose she wanted to pony me. Not how it works dear. Overall a great experience and always feel blessed to have such a great pair of horses. I’m not sure if that is the coldest I’ve ridden in or not. It was at least sunny so I thought – why not? So it’s cold. I have layers. I often say the only ride I regret is the one I didn’t take. I think I could have stayed home today and not regretted it. In the sun it felt pretty good really. I was dressed for cold. I had two layers of socks with a warming insole and a toasty toe sticky between inside my insulated winter riding boots. I had my warmest tights that have a full fleece inside and thick outside that I can’t wear in the house without burning up. 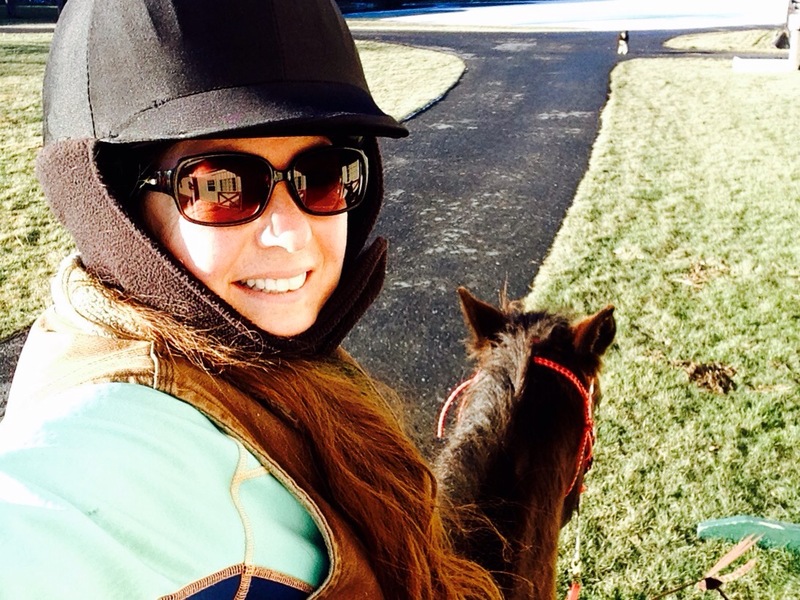 I wore underarmour then a polar layer with hood under my Horsewear winter coat that also has an extra removeable layer (I have not pulled that coat out yet this season- it hasn’t been cold enough!). I have SSG 10 below riding gloves and my pockets were stuffed with hand warmers. I even wondered if it was overkill. The first 10 minutes I just thought how pretty the sunny day was. After that I spent 80 minutes thinking “holy crap I am seriously cold”. I think Khaleesi assumed I was off my rocker but even in her teenage phase she respects me enough not to ask too many questions. 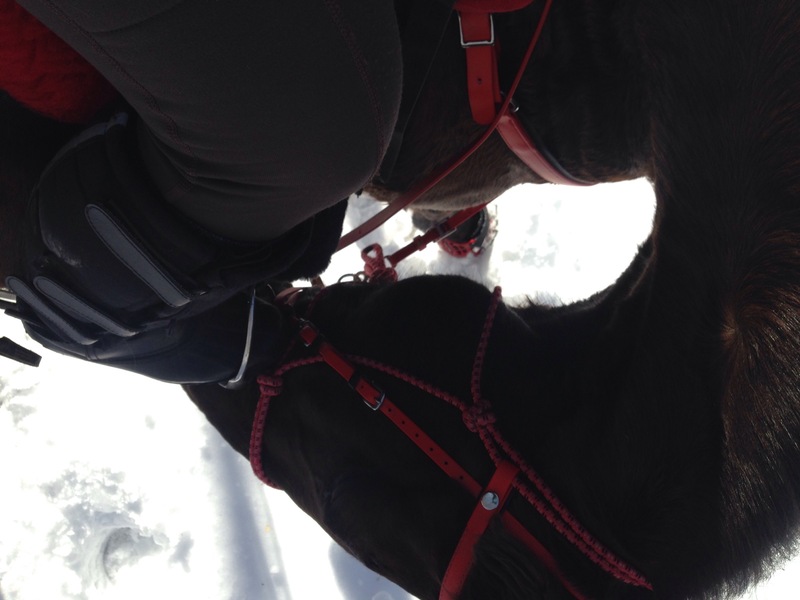 The ground was hard and frozen and we only did front boots so she walked along at about 3.5mph the whole 4 miles not seeming to care if we were headed away from home or back to the barn. 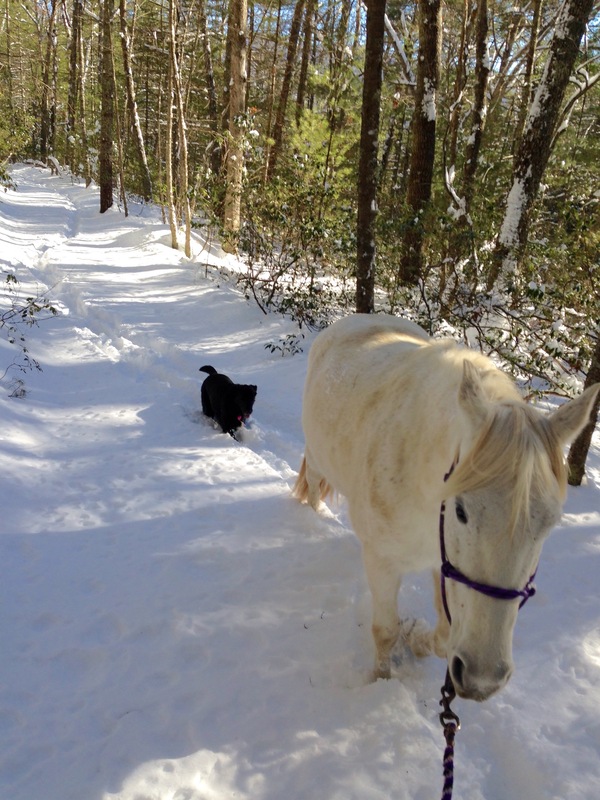 She trudged along with teeny ice balls forming on her whiskers from her moist breath. Glad I could regain the feeling in my legs after getting into the warm tack room I thought in the future I might stick to temps above 20 from now on. Last year was my first introduction to endurance and the start of my blog. This year I know just enough to be dangerous… And still have a long learning curve to go. I do have a few goals for this year, and hopefully they will help me continue with sound healthy horses and good experiences for me and those on my team. 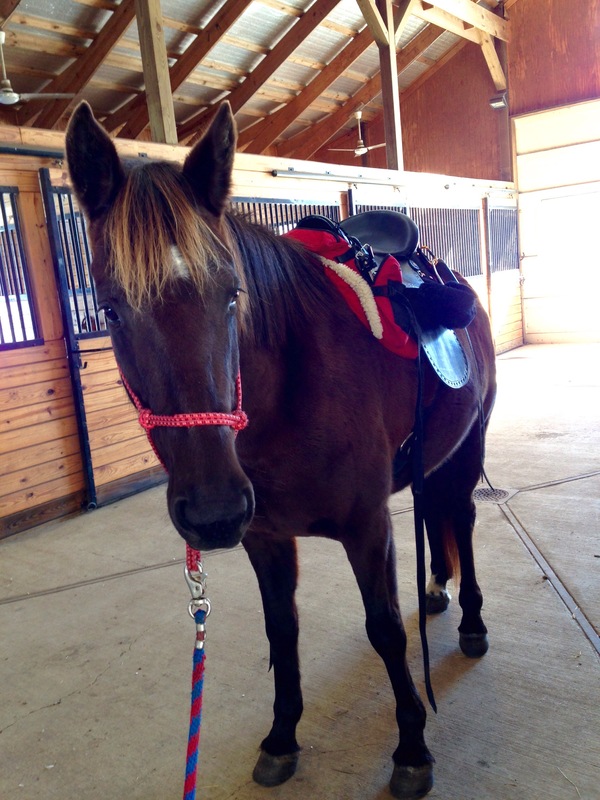 More importantly this goal is about improving how I use my body and in turn helping my horse improve hers. 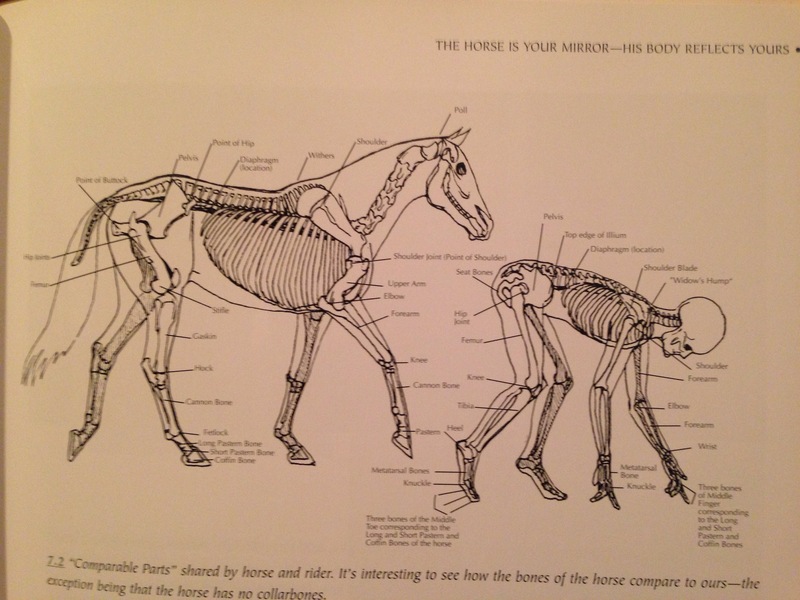 I have been fascinated with Sally Swift’s Centered Riding and she printed some great diagrams about how our body mirror our horse’s that I’ll add here. She has experienced that if the rider holds tension in an area it usually corresponds to an area the horse will hold tension as well. Pam worked a lot with me over the summer to engage rather than hollow out my lower back and it seems to have helped Khaleesi develop a nice top line as well. This is supported by the concepts in Centered Riding of finding your center and strength, balance and grounding come along with that practice. I have been focusing on this lately as I run. I have concentrated on using my center and not allowing my lower back to hollow and breathing all the way into that center. I also think of the ‘bubbling spring’ balance/pressure point under my foot as giving me energy and I have felt stronger and a little faster in my running. 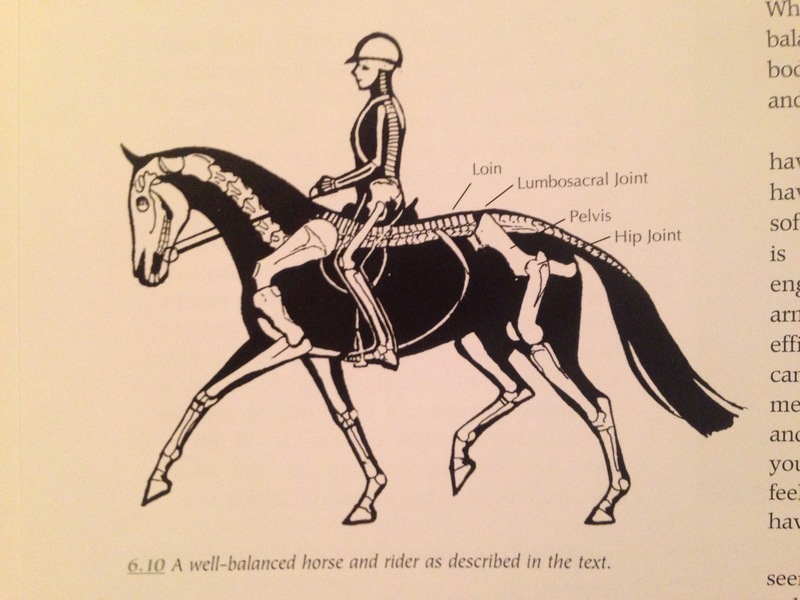 It’s also been interesting to consider how jogging is a lateral movement (arms and legs move a lot like a trot) and to work on ‘lengthening my stride’ and imagine how my horse has to work to add speed to her own movement. I can understand better how it takes time (and patience) to really develop that. Those are the ways I hope to improve my body and how I use it this year. Specifically- Team green has joined up with a ‘green bean’ (riders with under 1000 miles) team. We are the Rockin’ Mountain Monstas and I’m looking forward to having some team support and comraderie along the journey. In an individual sport where a leading motto is “Ride your own ride” it’s nice to have friends along the way. My riding goal this year is to do roughly a ride a month from March-October. I hope to do as many 50s as my horse can do healthy and sound, and to have the sense to move her back to LDs if that is what she needs. 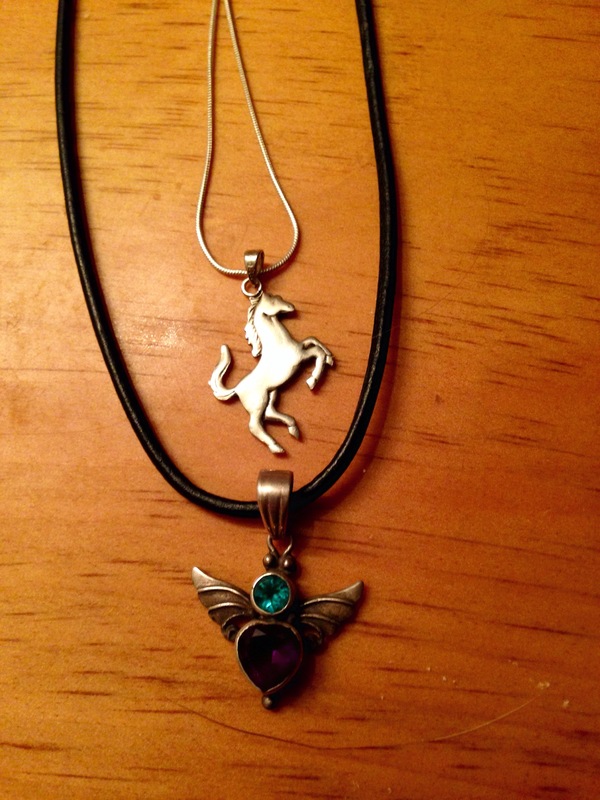 I have a pendant I bought almost 10 years ago when I was going through a major transition in my life. I chose it because it was the one I liked. After I bought it I read about the stones and design to find the piece was created to represent freedom (the wings) with strength (purple heart stone) and balance (blue stone). I strive all the time to find this balance in life. Sometimes I’m good, sometimes I’m not so good, and sometimes I can’t really tell. In order to be truly great it takes dedication and time- however I can’t ignore my husband, home and work to ride and train full time every day. Also my horses would hate me if I didn’t give them some down time mentally- and we always hear about the dangers of over working the horses and not allowing them to rest and heal in between events. So I work on strength to pursue my goals and fitness but also to find balance to keep a full life; engaged in my world to use my lessons from the horse world and to make the non-horse part of my world a better place. Of course I’ve already written here about my desire to not just be a good rider but to always grow towards being a horseman. 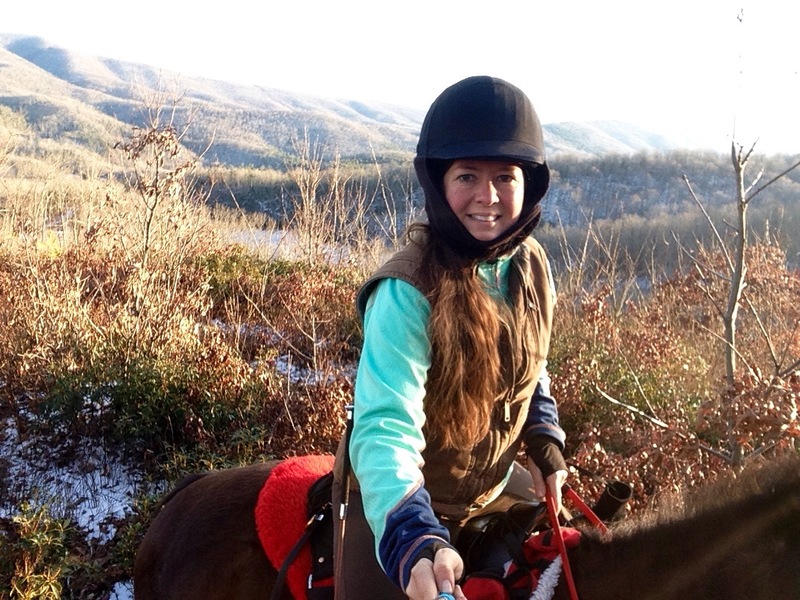 I hope through this year and every day for the rest of my life I will chase the feel and stay a student of Equus. For those of you who read these words- thank you for being part of the journey. Happy New Year and ride on in 2016! Very glad to be home after a nice visit with family. 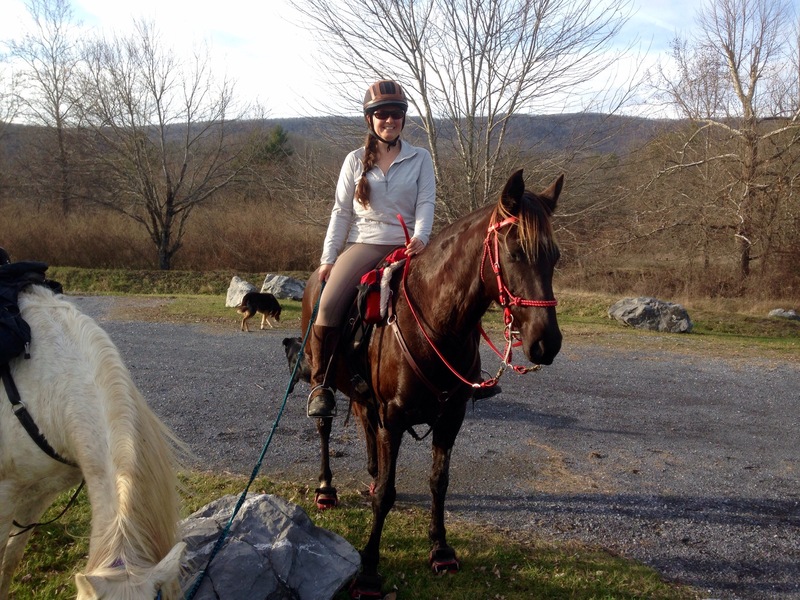 After a 5-day vacation the girls got out for a nice ride in the sweltering 72 degree afternoon. They did better than I’d expected with their winter coats already grown in but we took it easy on them just the same. Choosing a ride that had no big hill climbs and an overall pace around 3.5mph. 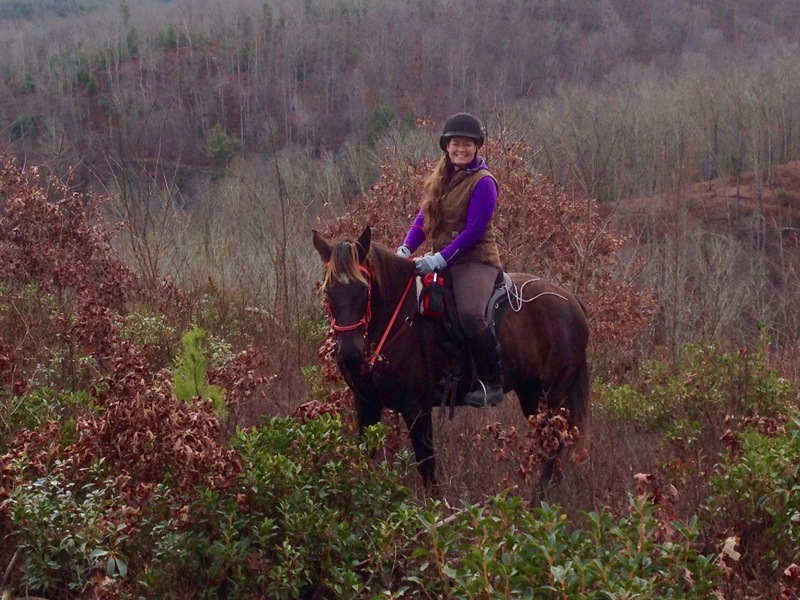 It was a pretty day, pretty ride, and good company (Susan and Nancy). 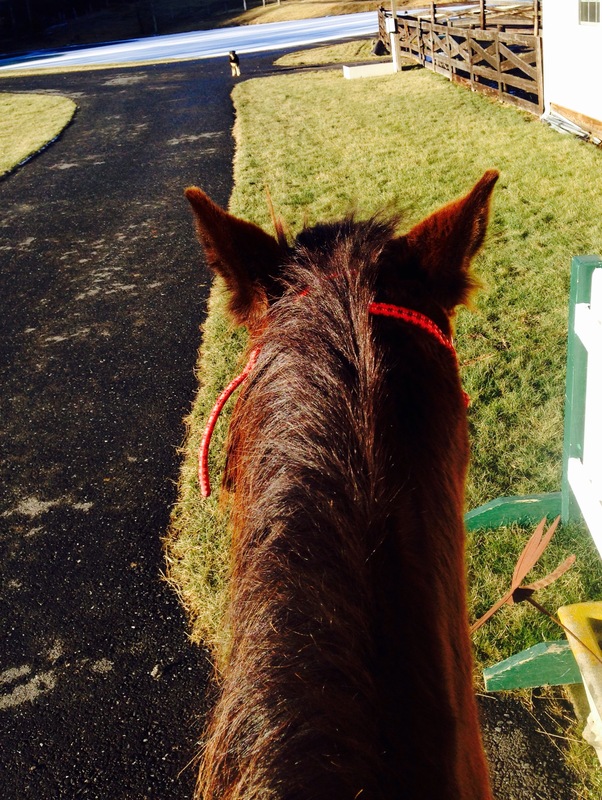 I love that my horses have been so willing to come out and hop on the trailer (they are sending on now pretty reliably) and seem to enjoy getting out and though we are riding a fair amount they don’t seem to be burned out or tired of the work. 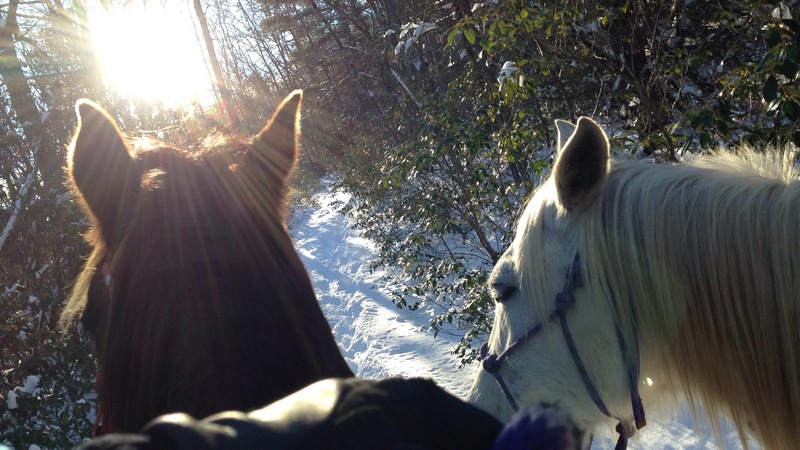 I think it helps that we have so much variety in our program- we do some harder conditioning rides occasionally but we mix in some yard work (in the arena), some slow poke take the farm horses for a walk rides, and some pleasure rides with friends too. All require something a little different from them so we don’t get stuck mentally. Khaleesi’s boots have been 100% since pulling shoes this winter- if they continue to work this well I might consider pushing back my shoe program just a bit. I am feeling pretty good about her heading toward 50s this year. She is getting stronger and faster and more solid mentally each ride. I am really pleased with how well she is doing this winter. Our work on walking faster is incrementally coming along. We drag and then trot to catch up much less now- and she trots off less often when I ask her to move out (at a bigger walk). I see nice improvement there. More rain in the forecast for this week but we’ll hope to get in a few more rides before work gets going again! Merry Christmas to team green and my blog readers. From Team Green’s Florida Contingent (Sarah & Madison) we got an early delivery of Omega Fields Horsehine supplements for hoof & health support. Both girls’ hooves are looking great, and their coats are healthy even in a few weeks from adding it. Also to help our feet stay in good shape this winter a new rider rasp to help clean them up in between winter farrier visits! 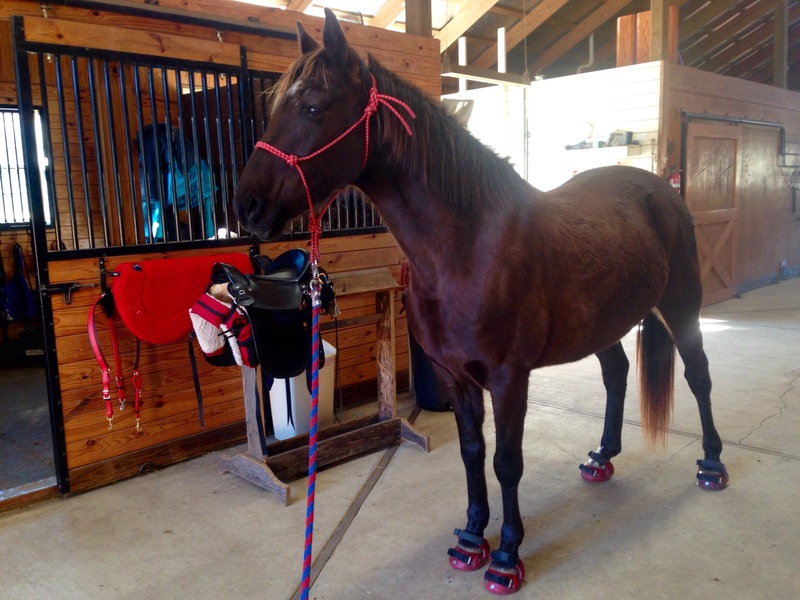 From Susan who is the newest member of the team and has been coming to do training rides on Faygo (which have been great for both training and conditioning for Khaleesi) we got help with a new set of front Renegade hoof boots for Faygo- to keep her moving through the winter without wearing out her front feet. Also from Susan a training log for 2016 to help us keep track of our miles and ride calendar for the year! My husband Ed (an honorary member of team green since he’s supportive from afar) continues to be my ‘gear guy’ and always comes up with thoughtful gifts to keep us riding in all weather and conditions! This Christmas he geared me up with half a dozen under-layers in every different weight and color- tops and bottoms… some with half zip, some with hoods, some with V necks, some with extra long arms that extend over my hands… super light for spring and ultra heavy for the coldest winter days- along with a bag of hand warmers, toasty toes and even the full feet insoles. 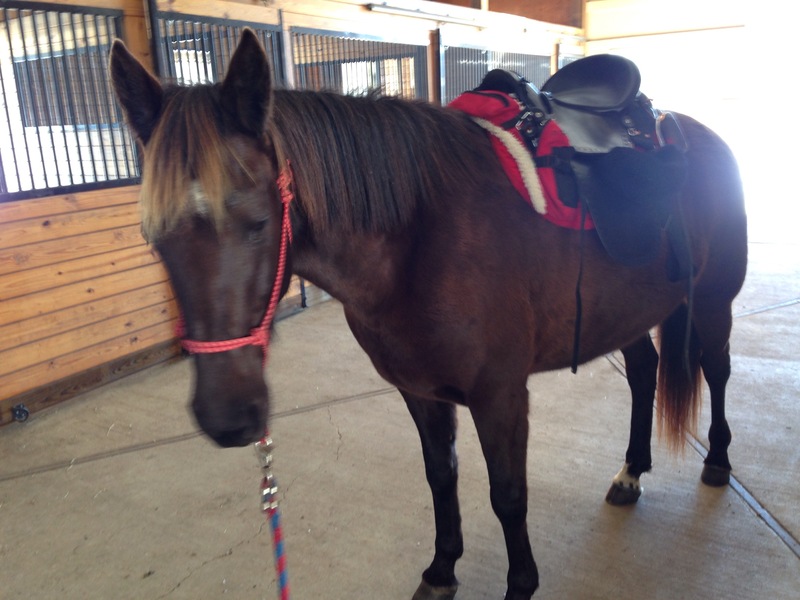 Also with a new saddle I need a new saddle pad- my mom sent a new Diamond Wool saddle pad that I’d wanted. She also sent some great cold weather tops to help keep me snuggly and warm- I won’t have to do laundry now for weeks and still have great clean gear! We are lucky to have such a great home barn and always consider Laurie as part of the team- even if she’s not with us often a hay feeder, or bucket, or fencing system, or just about anything else we might need and not have of our own is always there for us to borrow- and she gave me my absolutely favorite snuggly riding pants. 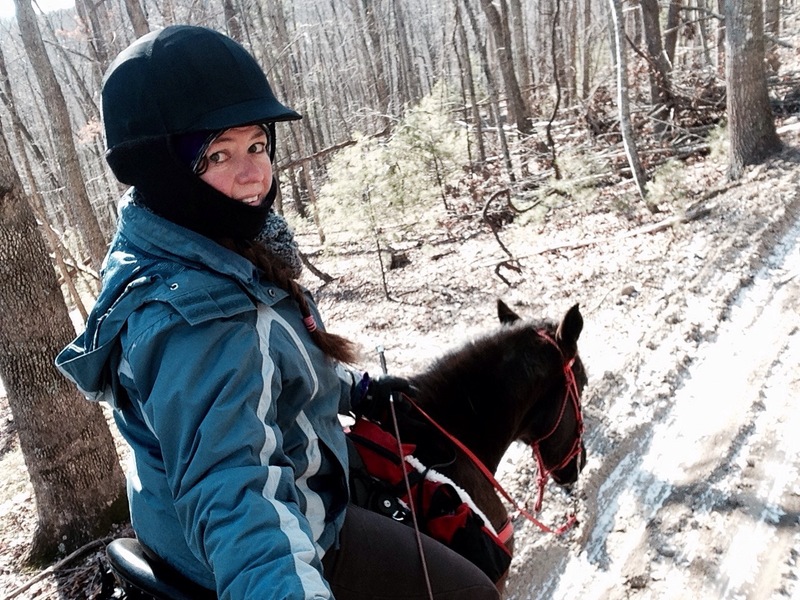 On the few super cold days we have had I just want to wear them – riding or not! I’ve never put on a pair of pants so cozy and warm in my life! 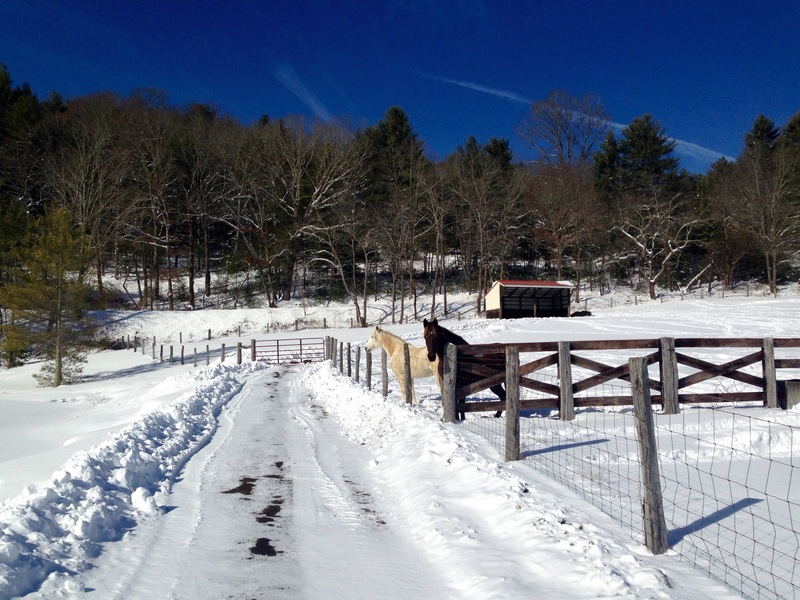 our happy barn home- the nicest barn I will probably ever share! My sister-in-law Kathy is not officially on team green and says she’s terrified of horses- but she drew my name in our santa swap and picked up a couple pairs of my favorite smart-wool snowboard socks (my current ones have threadbare heels). We are so lucky this Christmas to get so many great gifts helping us on toward our eventual goal- 100 mile one day ride… though this year the short term goal is taking on the 50s sound and healthy if possible. Christmas week has no riding as I’m on the road visiting family for the holidays. This year it doesn’t feel quite so bad because it’s pouring rain at home with flash flood warnings. I have tried to continue working toward our goals even on the road! 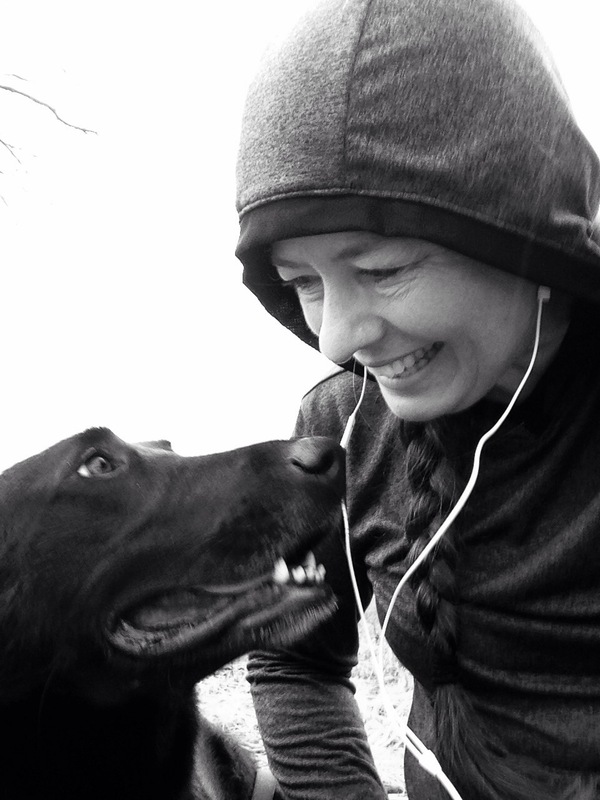 Peggy Sue and I are out there each day jogging 4 or 5 miles to offset the wonderful celebratory meals we’ve been part of. I know Khaleesi is better off every pound I can shed and to stay fit and in shape myself! As Peggy Sue and I were jogging this afternoon I was listening to my favorite Christmas album (Sufjan Stevens- Songs for Christmas) and when The Friendly Beasts came on it touched me to be reminded the part equines played in the Christmas story- and how God choose a barn to be the first stop of the Christ Child. Jesus our bother, kind and good; was humbly born in a stable rude. And the friendly beasts around him stood. Jesus our brother, kind and good. “I” said the donkey, shaggy and brown, “I carried His mother up hill and down; I carried her safely to Bethlehem town. “I” said the donkey, shaggy and brown. Thus every good beast by some good spell in the stable dark was glad to tell of the gift he gave Emmanuel. I’m not one to get overly concerned about celebrating special days. Sure- I like to do something special for birthdays… but I also like to try to make every day a day to celebrate and give thanks as much as I can. I try to find special moments on random days to enjoy and be thankful for. I hope I don’t only use our anniversary to tell my husband that I appreciate him and celebrate our life together… and on the flip side if we have a nice dinner together on the 19th instead of the 21st that doesn’t bother me at all. I did feel a special moment today with Peggy Sue, looking out over Western PA, jogging in the rain and finding some pretty blooms and berries left on random trees- hearing the song about how the animals welcomed baby Jesus in the barn and even though December 25th may have little to do with that event- it’s still the day we chose to remember it, and for a moment I stood quietly and pondered what it meant in my heart. 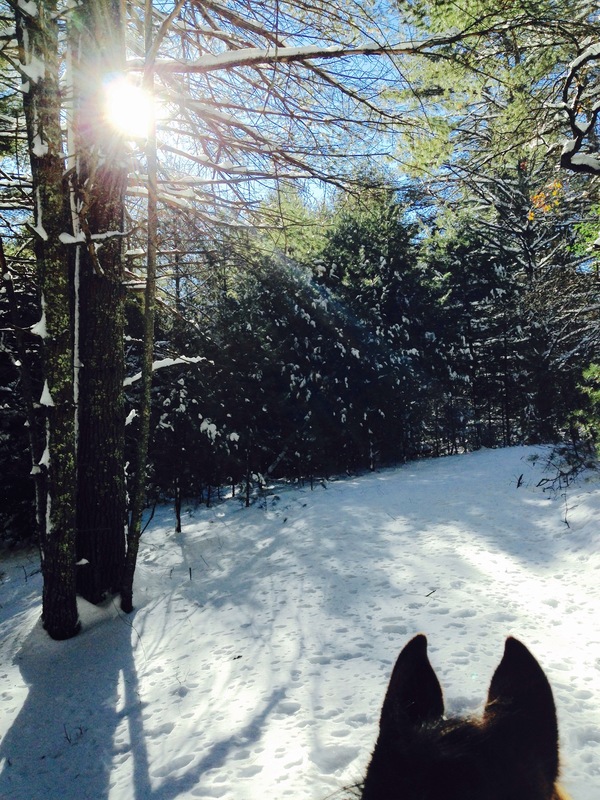 I hope you found a special moment today- or many- with family, friends, animals, horses or even that moment alone. Joy and Peace.